If you’d asked me years ago, I would’ve told you making a pine Christmas wreath must be really hard, and I could never do that. It’s the easiest thing ever. 2) Gather all the pine branches you can find and load them in your car. The only thing that matters is that (1) the branches are still green, and not brown and (2) they’re all the same kind of pine needle (for example, some trees have long needles and some have short needles; but I found most lots sell all of one kind or the other). 3) As a substitute for step #2 above, you can buy one or more trees at any lot (the cheaper the better) and cut them apart to make wreaths. 4) Move the greenery (or tree) to your work space and spread old sheets or blankets to protect the floor. Cut it in pieces about 6-7 inches long. Gather those pieces in medium-sized bundles. 5) Attach the bundles of greenery to a wire wreath form (available in several sizes at craft stores for about $3 each) using a package of green wire ($2 at a craft store). Use the same wire continuously until the wreath is finished. 6) Before attaching anything, wrap the wire around the wreath frame about 10 times, tying it in a knot several times and criss-crossing it so it’s as securely attached as possible. This single action basically holds all the greenery on the wreath form; if it’s not secure, the whole thing may fall apart, so I can’t stress enough the importance of this step! 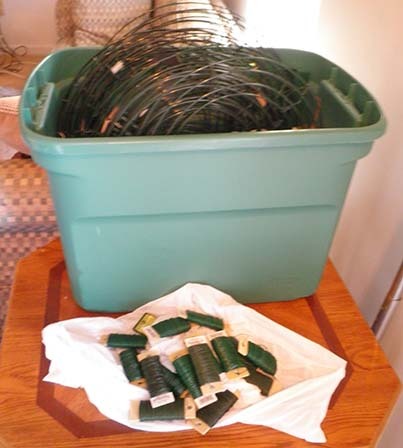 7) Lay the first greenery bundle across the frame wires, facing outward at an angle to the left. 8) Wrap the wire very tightly around the base of the greenery three times (about 2 inches from the bottom). Keeping the wire tight is critical, since all the greenery will fall off the wreath frame if you don’t do that! And if you wrap it too close to the base of the clump of greenery, the greenery can slip out. 9) You’ve done the hardest parts! 10) Now, continue placing bundles of greenery next to each other on the frame, all facing out at the same angle. Overlap part of each over the one before it so the greenery is thick. (This is not the time to scrimp and spread the greenery too thin, or you’ll have a Charlie Brown wreath…) Make sure all the wires all the way around the frame are completely covered with greenery, and don’t forget to wrap the wire around each bundle at least three times and tie it very tightly about 2 inches above the base of the greenery. The wires will all be covered with the overlapped greenery and won’t show at all later. 11) In about 40 minutes, you’ll probably have wrapped all the greenery you can fit around the wire frame and fastened it all on. 12) Wrap the fastening wire through the wires on the back of the frame about 10 times, tying knots and criss-crossing them as you did in the beginning. 13) With wire cutters (about $2 from a craft store), cut the fastening wire. 14) To keep your lovely wreath green for months, even in warm weather (! ), soak it overnight in a wheelbarrow or a bathtub filled with water. You’ll be amazed how much water the pine needles will absorb! 15) Let the wreath dry outside, and attach a bow to it you want. You can also buy inexpensive wreath embellishments at craft store (ornaments, birds, etc.) and add them, too, to create a theme wreath. 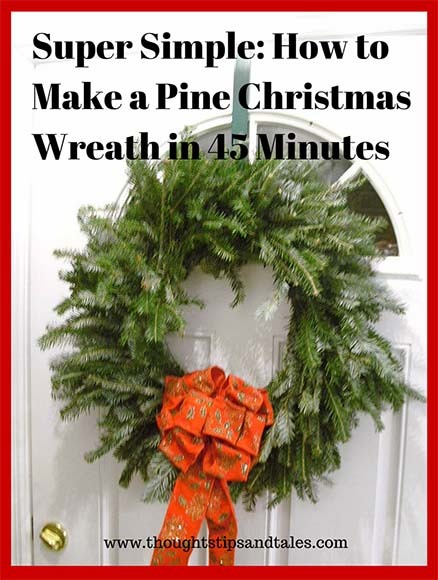 16) Pat yourself on the back because you just made your first Christmas wreath! 17) If you have greenery left, make more wreaths! They make great gifts and since they retail for $20 – $40 each, they’re inexpensive (but look expensive) and something that nearly everyone loves. This entry was posted in Christmas greenery, Christmas wreath, do it yourself Christmas wreath, pine Christmas wreath, pine wreath, wreaths and tagged Christmas wreath, do it yourself Christmas wreath, how to make a pine Christmas wreath, how to make a wreath, instructions for a pine Christmas wreath, pine Christmas wreath. Bookmark the permalink. I keep telling myself next year. Next year I will have worked a nice job with nice hours and my yard will be pretty and the outside of my house will be clean and my windows will sparkle and decorating the outside for Christmas won’t feel like I’m putting lipstick on a pig. I love this idea! The results are lovely! Thanks much for sharing! Reading this post brings back great memories of your parties. I still make my wreath your way here in PA. I miss y’all……Merry Christmas to everyone. Keep the blogs coming, I read it each morning……….great job.